Earth-orbiting satellites are collecting valuable data that reveal the environmental impact of fast-growing cities. October 11, 2002: While space technology was undergoing its spectacular birth during the 1950s and '60s, and visionaries were predicting the spread of human colonies into space, another kind of human colony was spreading rapidly--right here on Earth! It was the dawn of the modern suburb, a time of post-war prosperity when housing developments popped up across the landscape like mushrooms after a rain. Right: A reconstruction of the growth of Baltimore, Maryland, over the last 200 years. The U.S. Geological Survey used historical records as well as Landsat satellite data to create this sequence. Courtesy USGS. A half-century later, we now understand that many environmental problems accompany the outward spread of cities: fragmenting and destroying wildlife habitat, for example, and discharging polluted runoff water into streams and lakes. The emerging space technology of the 1950s has grown along with our cities. As you read this today, dozens of high-tech satellites are circling our planet, gathering terabytes of scientific data about the environment. These data provide a unique "big picture" view of the effects of urban sprawl. Unfortunately, many city planners still don't have access to that big picture. "Currently there's no good end-to-end system for getting useful satellite data on the impacts of urban sprawl into the hands of local decision makers," says Chet Arnold, associate director of the Center for Land-use Education and Research at the University of Connecticut (UConn). But he and his colleagues at UConn are working with NASA to change that. They've started a project called NAUTILUS to provide city planners satellite data quickly and in a form that non-scientists can understand. "NAUTILUS is one of seven Regional Earth Science Application Centers (or "RESACs") around the country funded by NASA," says Rodney McKellip, who manages the RESAC program from the Stennis Space Center in Mississippi. Why NASA? The Earth Science Enterprise of NASA is responsible for many of those satellites circling the earth, and they are used to fulfill NASA's mission to understand and protect our home planet. "RESAC was started in 1998," continues McKellip, "as a way to get vital Earth science information into the hands of local and regional decision makers." in Connecticut, Massachusetts, Maine, and New Jersey. The local public officials in these regions are making their information needs known, and the scientists are learning to format the satellite data in ways that meet those needs: color-coded maps, for example, or time-lapse animations. Left: During this "NEMO" workshop in East Haddam, Connecticut, city planning officials were shown how to understand and make use of satellite data for land use decisions. Because humans are so visually oriented, such graphics can communicate lots of complex information in a quick, intuitive way. Simply watching a 30-year animation that shows your city rapidly engulfing the landscape can be an eye-opening experience. "We all sat there a little stunned," says Christine Nelson, recalling the first time she and her fellow city officials were shown animations of historical city growth. 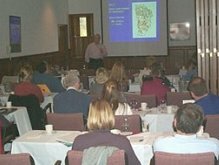 Nelson, who is the director of the land use department for the Town of Old Saybrook, Connecticut, participated in a related UConn program called Nonpoint Education for Municipal Officials (NEMO). The satellite record gives a compelling view of the past, but what about the future? After all, it's the future consequences of land use that city planners must contemplate. One tool that the NAUTILUS researchers are using is like a computerized "crystal ball." 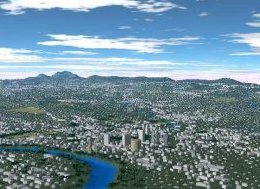 It's a software package called CommunityViz (based on the commercial map-viewing program ArcView) that lets city planners envision a hypothetical future of their city, assuming that it grew according to current zoning patterns. They can view simple maps, color-coded for environmental impacts, or they can choose to "fly through" a photorealistic 3D map of their future city to get a more visceral sense of things to come. More importantly, it lets them make changes and view the likely outcome of different growth scenarios. More-sophisticated techniques can wring all kinds of useful numbers from satellite data: estimates of water-quality degradation due to development, for example. Hard numbers like these are crucial for making and justifying the tough decisions public officials face. In the cities involved with the NEMO and NAUTILUS pilot projects, these accessible forms of satellite data have already had an impact on decision making. Nelson offers this anecdote from her own Town of Old Saybrook: "Using these new satellite-based tools, the planning commission recently realized that huge tracts of unfragmented forest will be interlaced with paved roads as residential development sprawls into the relatively undeveloped northwest quarter of town." Such "forest fragmentation" can cause problems. "Forest fragmentation occurs when large, continuous forests are divided into smaller blocks, either by roads, clearing for agriculture, urbanization, or other human development," explains Arnold. "Increased fragmentation due to urban development poses a threat to biodiversity primarily in animal populations, as their habitats are chopped up (fragmented) into smaller and smaller pieces." To avoid these problems near the Town of Old Saybrook, "the planning commission (inspired by the satellite data) is spearheading modifications to the comprehensive plan of zoning regulations," notes Nelson. Below: This NAUTILUS map of Old Saybrook, Connecticut, is color-coded to show the percent of the landscape covered by impervious surfaces (such as pavement and rooftops) both today (left) and in the future (right) if current zoning patterns are fully developed. Separate research has shown that more than 25% of impervious surface (red) in an area leads to major impairment of local waterways. Bringing together the information for these maps also means working out a lot of technical nitty-gritty. There are dozens of Earth-observing satellites: Terra, Aqua, Landsat, SPOT and IKONOS, for example. Each carries its own suite of scientific instruments. Which data should the NAUTILUS system use? And how can the 30-year satellite record--taken from a series of satellites with different properties--be integrated into a consistent record of changes in the landscape during that time? The NAUTILUS program is working these details out so that city planners don't have to. If the project is successful, other cities will soon join Old Saybrook in using satellites to better understand the environmental impact of humanity's expanding "colonies" here on Earth. National Land Cover Characterization Project -- access to land-cover information for the 48 contiguous U.S. states, from the U.S. Geological Survey.